It seems that the plastic carrier bag is becoming a thing of the past. Environmentalists and fashion lovers alike are swapping plastic for more eco-friendly reusable material bags. The tote bag in particular is a perfect solution for shopping, as it is strong and durable, has a large capacity and looks great. The tote, it seems, is becoming one of the accessories to be seen with. You can make your own tote bag for a fraction of the price of a shop-bought specimen. Creating your own tote will also mean that you can create a bag that suits you and your style perfectly. Tote bags are so simple to make that you can easily make yourself a range of totes to suit different outfits, or create bespoke totes as gifts for friends and family. 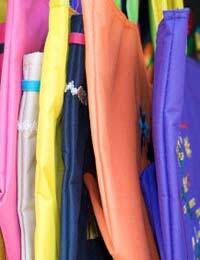 This article looks at one easy method for making your own tote bags. You should make sure that the material you use is fairly strong, especially if you intend to use your tote bag for carrying groceries. Materials that have stylistically frayed edges also tend to be unsuitable, this is because if the edges aren’t hemmed properly they can weaken and tear. To start, it’s a good idea to wash your fabric (providing it’s actually suitable for machine or hand washing! ), dry it and iron out all creases and wrinkles in the fabric so that you are working with flat material. Then measure and cut out the area on the fabric for the two squares to make the two sides of your bag. Bear in mind that you’ll be making a half-inch seam around three sides of the bag. At this point you can embroider, embellish or add any iron-on transfers to your bag. Although it can be done after the bag sides have been stitched together, it is easier to manipulate the fabric before it is attached and becomes a bit fiddlier to deal with. You can then get ready to stitch the sides together. Line up the two sides of each square of fabric that will make up the right hand side of the bag (taking care to make sure that you have the fabric the “right way round” on both panels!). You can then stitch or machine sew the seam one side of the bag around half an inch. Once you have stitched the first bag side, you will need to sort out the edge of the top of the bag, where the opening is. This cannot really be left as a raw edge, as it will fray and look sloppy. An easy solution is to use a sewing machine to zigzag the raw edge. Then fold the edge over around 1 1/2 inches on the inside of the bag, and iron to create a straight line. The top seam can then be stitched around ¼ of an inch from the top edge. You can then reinforce the top seam by stitching another line around 1 ¼ inches from the first line of stitching. Once you have stitched your first side, you should stretch the material accordingly and pin the bottom hem in place, before tackling the tote bag handles. You can either use pre-made strong ribbon or create your own handles from strips of material. If opting to create your own handles from material, take your one of your 2 ½” material strips and fold them in half lengthways, making sure that the straps are inside out reading for seaming. You will then need to seam the raw edges together all the way from the top to the bottom. The seam will then need to be ironed flat and open. The take your long knitting needle or wooden spoon handle, and poke the material through until it has been pulled inside out again to the correct side – the material should now look like one long handle. Repeat again for the other handle. The ends should be left open, as they will be sewn to the inside of the bag and closed shut. The sewing in this method can also be replaced by using bonding web to fix the material together. To fix the handles to the bag, take one of the seamed ribbon pieces and tack in place so that the handle will take up the middle third of the bag panel. If the ribbon handle is long enough, make sure that you tack it down on the inside right at the bottom of the bag panel, as this will increase strength and durability. This should be done with both ends of the ribbon on the same panel to create the handle shape over the top edge of the bag panel. Again, you can always opt to use bonding web rather than machine sewing or stitching, or both for extra strength. If stitching using a machine, bear in mind that your stitches will be viewable on the bag panels, so try to keep the stitches in a neat rectangle shape. By hand, the single line of stitches to fix the handle should be reinforced and stitched over several times in the same place. Repeat these steps for the second handle on the remaining bag panel. Again, stitch a hem around ½ inch from the bottom of the bag panel, taking care to secure the handles in place. As the bottom of the bag may require more strength than the sides, it is always a good idea to stitch over two or three times. You can then tack and sew together the final hem on the side, before turning the big inside out with all your stitching and sewing now on the inside, hidden from view. Your bag is now ready for use!